Melissa intuitively selects songs and creates playlists, relative to the subscribed workshop thematic. Each playlist supports a compassionate and empowering journey during which songs are broken down lyrically as Melissa guides you through processes, shares useful tools and opens discussions while undiscovered parts of you show themselves for transformation. You will be offered the opportunity to participate in additional guided visualisations and have access to affirmations written exclusively to facilitate you on your unique path to self expression and connection. Words are often limiting when it comes to describing where we are at any given moment, whilst music offers a full expression. Releasing all that no longer serves you from the past, allowing you to consciously clear the slate and start afresh. The FORGIVE.FOCUS.FORWARD course gives you powerful tools and processes to apply to every aspect of your life. They facilitate fearless exploration, expression, expansion and empowerment; leaving individuals open to limitless possibilities. “Inspiring Intuitive ground breaking work; IMP at a whole new level. Melissa has successfully created a Sacred Safe Space filled with Love Trust and Kindness. This encourages participants to open up; delve deep and begin the inner work to embark on an Amazing Journey of personal Transformation. Her choice of music is Intuitive and resonates. This workshop’s focus is to address and manage the often inexplicably complicated Adolescent chapter in our journey. Untangle.Understand.Accept gently guides Tweens, Teenagers and Young Adults through one of the hardest periods of their young lives. In this stage of life, they find themselves having to navigate through the confusion and frustration that results from a struggle to express and communicate their needs reasonably and with clarity, in what often seems like a restrictive world. Intuitive Music Programming facilitates this journey of self discovery, expression, empowerment and fully supports taking action. UNTANGLE confusion and frustration through guided listening sessions, participatory exercises (processes) and fun discussions that cultivate focused connection with essence of their true-selves. UNDERSTAND that things happen FOR them and not TO them; that in every experience there is the opportunity to step into their strength to make choices that serve them towards positive growth. ACCEPT and exercise their intuitive skills by contributing their own song choices and playlists to the group, that support their's and others' respective experiences. 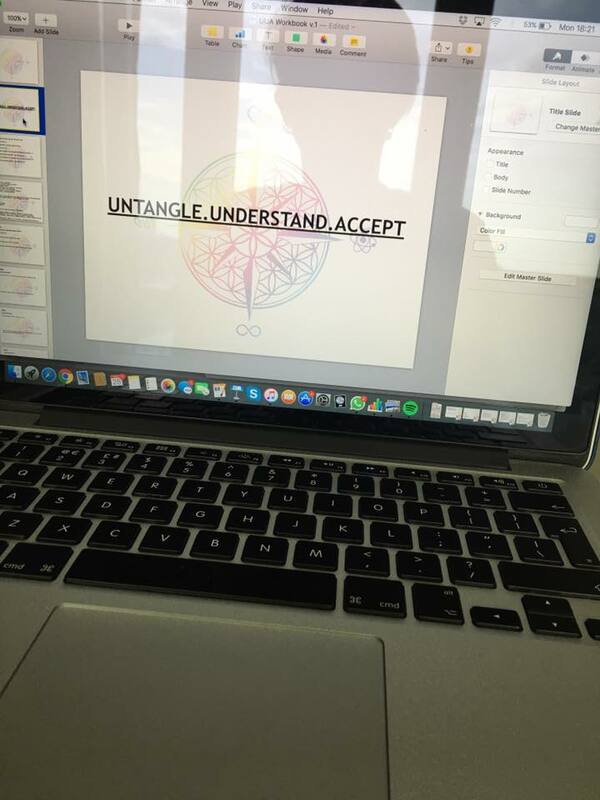 The UNTANGLE.UNDERSTAND.ACCEPT Workshop provides tools and systems for the individuals to integrate into their lifestyles, empowering them with the ability to adapt in an ever changing world. Music opens all channels of expression and facilitates communication. This programme's focus is to review, calibrate and re-align our Energetic Centres also known as Chakras. Throughout our lives as we grow physically, move through and evolve in an always changing world, the energy flowing through us is often compromised. This happens as a result of physical, mental and emotional injuries and "scarring" which create blocks to the abundance that life has to offer each of us. Any imbalances are acknowledged and calibrated to support our current placement in life - this can be viewed as your very own "system update" and opens you to the ABUNDANCE that is Your's to claim! This IMP online course gives you powerful tools and processes to apply to every aspect of your life. It fosters healthy curiosity and sponsors empowerment through radical forgiveness; leaving individuals open to limitless possibilities. This process was created to heal debilitating fears. Certain areas in our lives can feel stagnant and "stuck" because of Fears that hold us back, preventing us from reaching our goals. Your Fears show up as a guide to the unhealed parts of you that need attention. Make Fear your ally. Here is a simple process to get you on a grounded track towards clearing the fears that are stopping you from moving forward in your relationships whether personal, social or business. — Tamara Duncan, Corona U.S.A. It doesn’t matter if your goal is to create more harmony in your life, to attract abundance, improve your golf swing or to heal a broken relationship. SVH is a versatile tool that identifies the seeds and foundations of imbalance and reforms them to support success, personal empowerment and personal sovereignty. All of this can be achieved through an inner peace and a stillness that is established when mind chatter is quieted. The foundation for this modality is Quantum Level Reprogramming (QLR). QLR is a reformatting tool that empowers the Creator to energetically release limiting beliefs and perceptions, while reformatting genetic predispositions and non-serving life patterns. Quantum level reprogramming helps to silence random inner dialog, freeing the quieted mind to form it’s creations in a focused clarity that will support rapid and even instant manifestation. SVH is all about sovereignty, autonomy and the freedom to live a life that is free of the attraction of limiting experiences that have the potential to block your smooth, graceful, expedient evolution to higher consciousness. Imagine being able to focus your mind with laser-like precision, developing levels of conscious awareness that foster a focused clarity that assures you only fuel events and experiences that are aligned with ideal realities. Melissa is a Level 4 and Animal Healer Practitioner and Level 1 & 1M Teacher. SVH is a personal empowerment system with tools that works at the transcendent levels to reform foundations of limiting beliefs and perceptions that can stop you from reaching your highest ideal. By gifting an IMP Online Course to a friend or family member, you are entitled to a 25% discount on your own enrolment fee. You can also opt to be an anonymous sponsor to a recipient recommended by Melissa. Full disclosure of the proposed recipient's status will be shared with the sponsor on request.